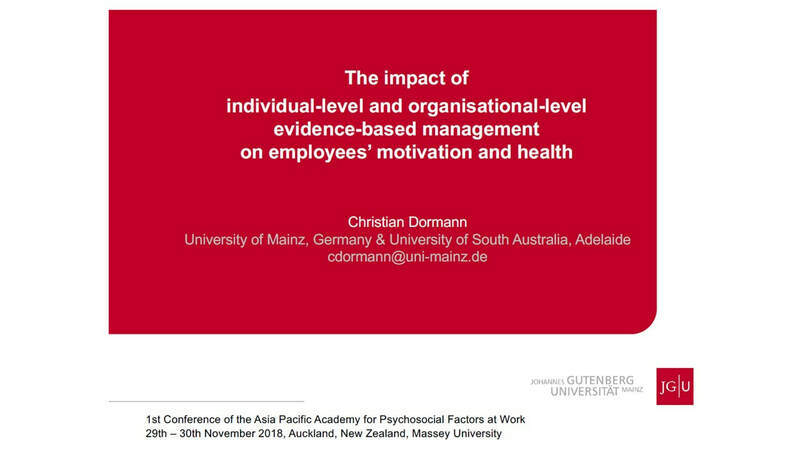 Christian Dormann is Professor at the Faculty of Business Education at Johannes Gutenberg-Universität Mainz, Mainz, Germany and also adjunct Professor at the Asia Pacific Centre for Work Health and Safety, a WHO Collaborating Centre for Occupational Health, at the University of South Australia. His major research interests are job-related areas. He has served as an editor, associate, consulting editor and author in several organizational and psychological journals. 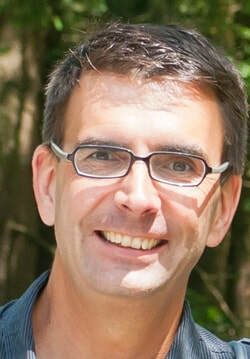 His current research interests mainly relate to the impact of organizational climate factors such as PSC on work places. Although evidence-based management (EBM), that is, making managerial decisions that are founded on existing evidence, has been proposed as a key success factor for organisations, there is no available evidence of possible negative or positive effects of EBM on employees. This applies to EBM in general and to evidence-based school management (EBSM) in particular. In this presentation, I elaborate on the historical development of different perspectives of EMB and present the results of two studies, in which a measure of EBM was developed and the cross-sectional and longitudinal effects of EBM at the individual and the organizational level were analyzed. In particular, I investigate the impact of EBM and EBSM on employees’ job satisfaction, role-breath self-efficacy, and work engagement, and I also analyse the effects of aggregated ‘organizational-level EBSM/EBM’ on individual employees’ outcomes above and beyond the perceptions of the individual employee. Empirically, three measured facets of EBM emerged, which could be replicated with data gathered from teachers and employees as well as with data obtained from principals and managers: Internal evidence orientation (IE), external evidence orientation (EE), and evidence-substitute orientation. Without exception, all analysis demonstrated positive effects of EBSM/EBM on teachers’/employees’ motivation and health, which suggests that EBSM/EBM may jointly serve performance goals of organisations as well as well-being goals of individual employees. Furthermore, school-level EBSM improved school-level teachers’ job satisfaction and work engagement after 2.5 years, but there was no evidence for reversed effects. This suggests, that EBSM/EBM may actually causally impact on the motivational and health-related outcomes. Maureen Dollard is Professor of Work and Organisational Psychology and Director of the Asia Pacific Centre for Work Health and Safety, a WHO Collaborating Centre for Occupational Health, at the University of South Australia, and Honorary Professor at the University of Nottingham. Her research concerns workplace psychosocial factors and she has published extensively on the topic. Maureen is on the board of the International Commission on Occupational Health, the editorial board for Work and Stress, the Journal of Organizational Behavior, and the European Journal of Work & Organisational Psychology, and the advisory board for the beyondblue Workplace Mental Health Advisory Group. She co-established the Asia Pacific Academy for Psychosocial Factors at Work, and is Fellow of the European Academy for Occupational Health Psychology. 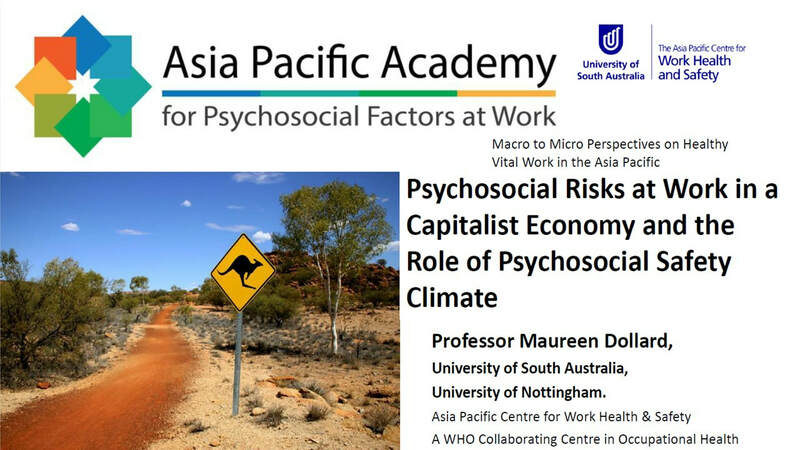 Maureen is the innovator of the Psychosocial Safety Climate theory and applications, key benchmarking metrics of employee wellbeing, national surveillance of working conditions via the Australian Workplace Barometer, and bringing an economic focus to occupational health. The calculus for decision making in most modern societal structures is economic rationalism. Under capitalism there is a relentless demand for increased profits, performance and productivity coupled with tight resources that expose workers to poor quality work conditions. In turn, poor quality work conditions can lead to mental and physical ill-health, with significant costs to organisations such as high rates of sickness absence and reduced performance, and costs to society such as loss of potential labour supply and high rates of unemployment. Organisations characterized by a good psychosocial safety climate (PSC) offer a point of resistance to these pressures. Psychosocial safety climate concerns the value and priority given to worker psychological health compared to productivity imperatives such as downsizing and lean structures. Far from undermining productivity we expect that pro-social options embodied in high PSC organisations that value worker psychological health will lead to better quality work options, increased meaningfulness, increased possibility for creativity and innovation, and reduced productivity costs associated with sickness absence and presenteeism. This presentation responds to a public health priority and a call from the OECD to prevent and manage mental ill-health and promote health and well-being by drawing attention to the connection between work and mental health. This presentation will discuss contemporary economic policies, work stress issues, PSC theory and evidence-based implications for organisations and national level, policy, practices and procedures for worker psychological health. The presentation will highlight how PSC affects working conditions, employee health and well-being, and organisational outcomes, with evidence from around the globe. Multilevel evidence from around the globe will be presented to show that PSC precedes work quality (demands, resources) and the social-relational aspects of work (harassment & bullying, social support). Evidence supporting the expansion of work stress theories to include national (e.g., culture, legislation and regulation, corrupt values, welfare regimes, union representation), organisational (e.g., PSC) and team level factors will be explored. International research showing the impact of PSC on working conditions, health and productivity; cost estimates for improving PSC at work; PSC benchmarks for job strain and depression; and implications for work systems improvements will be discussed. Evidence supports PSC as a ‘cause of the causes’ of work stress, and a theoretical precursor to many job design-based work stress theories. 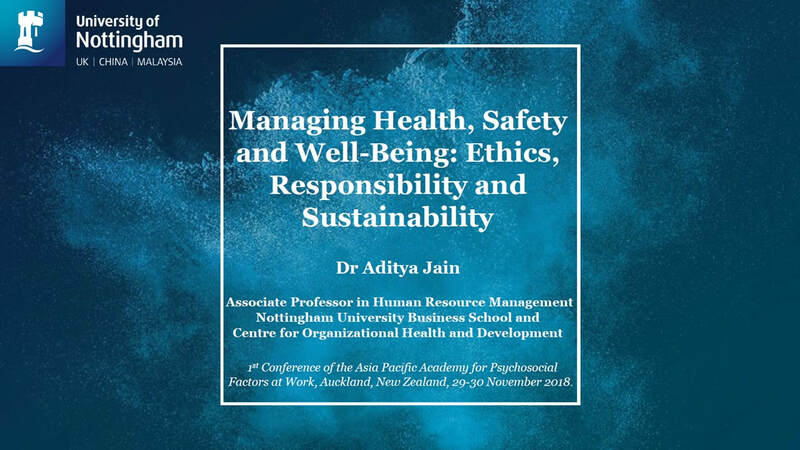 ​Dr Aditya Jain is Associate Professor in Human Resource Management at the Nottingham University Business School and co-director of the Centre for Organizational Health and Development, a World Health Organization Collaborating Centre in Occupational Health, at the University of Nottingham. He is member of the British Standards Institution ‘British Standards Health & Safety Committee’, a member of the International Standardization Organization’s technical committee on Human Resource Management, the Executive Officer of the European Academy of Occupational Health Psychology and Associate Editor of the journal ‘Safety Science’. His research has focused on the management of psychosocial factors at work and the translation of occupational health and safety knowledge into policy and practice. He has a keen interest in the role of business in society, particularly in relation to the management of the employment relationship. More specifically, Aditya’s work has focused on examining the role of softer forms of policy, such as voluntary standards, social dialogue and business responsibility in the area of managing working conditions. Major developments over the past two decades have given special attention to the concept of "sustainability," and the integral role of health, safety and well-being at work in sustainable economic growth. For enterprises, sustainability refers to the potential for maintenance of business success over the long term, while for workers sustainability is the potential for long-term maintenance of well-being, the two conditions being inextricably connected. There is increasing evidence which clearly indicates, on the one hand, the economic threat posed by hazardous working conditions and on the other hand, of the mounting evidence of superior market performance of enterprises which promote health, safety and well-being at work and incorporate social concerns in their sustainability efforts. However, sustainability efforts have, until recently, most commonly focused on environmental responsibility. In 2012, the United Nations Rio+20 summit, the largest global summit on sustainable development reiterated that there are three dimensions to sustainable development – society, environment and economy – which are intertwined not separate. Sustainability is a paradigm for thinking about the future in which environmental, societal and economic considerations are balanced in the pursuit of an improved quality of life. Sustainability is therefore a long-term goal, while sustainable development refers to the many processes and pathways to achieve it. Business responsibility initiatives (also commonly referred to as corporate responsibility, corporate social responsibility, corporate governance, corporate accountability and corporate citizenship) are increasingly used by companies and their stakeholders as the normative framework for social aspects of sustainability (e.g., ISO 26000, UN Global Compact, Global Reporting Initiative, UN Business & Human Rights Initiative etc.). The European Commission in 2002, published a communication titled “Corporate Social Responsibility: A business contribution to sustainable development”, developing the idea that there are both internal and external dimensions of responsible business practices; ‘internal’ in that they are targeted at management and employees of the firm itself, or ‘external’ in that they are targeted at outside groups such the society or the environment. The internal dimension of business responsibility includes socially responsible practices concerning employees, including those relating to their safety, health and well-being. Improving working conditions and promoting the health, safety and well-being of workers are clearly relevant to the CSR activities and sustainability of the firm, as can also be seen in the increased reporting of these issues in annual company CSR/sustainability reports. Taking care of the workforce and developing its capacity (mentally, socially, etc.) has strategic importance for organizations and society alike. Safe and sound jobs, secure and fair employment and decent working conditions provide financial security, social status, personal development, social relations and self-esteem, and protection from physical and psychosocial hazards – each important for health and safety. An active healthy workforce is therefore a key determinant to sustainable economic and human development. Major initiatives in the area of sustainable development, such as the newly adopted sustainable development goals (SDGs), explicitly refer to full and productive employment and decent work for all as a means of achieving sustained, inclusive and sustainable economic growth, and include goals relating to protecting labour rights and promoting safe and secure working environments of all workers, including migrant workers, particularly women migrants, and those in precarious employment. While recent 'integrative' initiatives to promote good practice in OSH, such as the WHO Global Framework for Healthy Workplaces, the NIOSH Total Worker HealthTM Approach, and the ISSA Vision Zero campaign highlight the importance of business responsibility and sustainability, there are however a number of gaps in research and practice which have led to limited diffusion of such approaches, which link sustainability, business responsibility and health safety and well-being, both at the organizational and policy level. The presentation will identify critical gaps and propose an agenda for research and practice to further develop and promote employee health, safety and wellbeing through a sustainability approach.